TV package has 154 channels. Most of the time there is nothing to watch, not even of the least interest. Well, except, sometimes Asian food channel. Only sometimes, because usually there are too much of those: mmmmm, ahhh, so tasty, oh this is so easy, crap. Those TV hosts and cooking industry, never miss a recipe, and they never have to throw the whole lunch away. Fake, like any other reality show. But there are exceptions, and one of our favorite shows is Dosanko cooking. The japanese host Mrs. Sachiko Hoshizawa, entered the Guinness Book of World Records for having the longest live cooking show in Asia – 14 years running. Her recipes are for homemade food. With Mrs. Hoshizawa Japanese cooking started to look easy to do. Her best advise is to cook with fresh sessional ingredients. Coat the fish with mixture of corn flower and salt. Heat medium size saucepan, put the kombu inside and top it with a fish. Add sake. After few seconds sake will evaporate and than add water, mirin and soy sauce. Close tightly with a lid and cook on low heat 15 minutes. Add salt and pepper to taste. Diagonally julienne ginger, spring onion and nori. 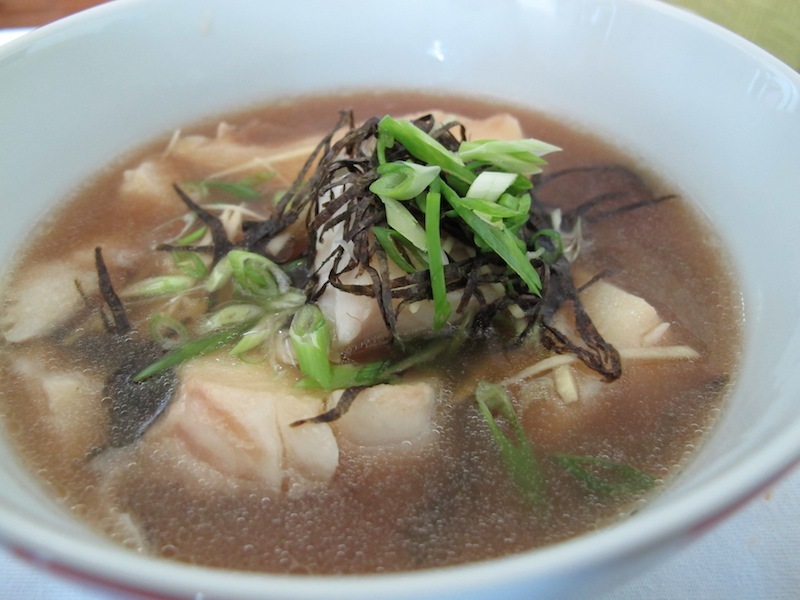 Arrange the soup and the fish in a soup bowl and sprinkle with nori, spring onion and ginger.